-Reuse an Easter basket from a previous year instead of spending extra money buying a new one. You could also go to your local thrift store and pick up a second hand one. Every holiday you can finds tons of wonderful decorations at the thrift store! -Also, if you are feeling super crafty you can always make your own Easter Basket out of recycled or reused items sitting around your house. 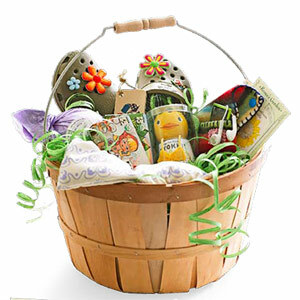 -Find an alternative to the plastic, petroleum based Easter grass for your child's basket. There aren't too many other uses for the plastic grass after Easter, so it'll be better not to even buy it! Instead of plastic grass you can used paper from the paper shredder! Shred up your old magazine pages or the comics for some extra color. If you don't have a shredder you could ask a friend that has one at work. You can even recycle the shredded paper when you are finished. -Another idea is to line the basket with some soft goodies like socks, a soft book, or stuffed toy. Be creative! The possibilities are endless!! -Reuse those old plastic eggs from previous years, most of us have a ton. If you need more, once again, go to the thrift store. -Instead of dying your Easter eggs with chemical dye kits from the grocery store, get out the crayons & non-toxic markers and let your little ones go at it. It's healthier & greener and is still lots of fun! HAVE A VERY BLESSED EASTER! !